Be fore renovation, some gym floors may need major or minor repairs. We will assess them to determine the work required to create the perfect surface for the later stages of sanding, staining and sealing. We fix any loose boards, removing any old tacks and nails. Protruding nails are hammered flat. If any boards are damaged beyond repair, we will replace them using reclaimed timber - wherever possible, of the same quality and age. Stains enhance the wood grain and are used to alter the colour of wood (egg: darkening a pine floor). Floor stains are applied by hand or roller and take at least eight hours to dry. Coloured varnishes are available, but we recommend staining and varnishing in two distinct stages. It is easier to maintain control over the colour and the durability of the sealant will be enhanced. As the varnish or sealant wears away, it will not affect the underlying coloured stain. Coloured wax is a good choice for floors with dull, washed colours. It can also match your home interior by quickly lending some colour to your room. You will get an affordable new floor that looks completely different. As well as the traditional solvent and oil-based wood stains, we also use door-free, water-based stains. The colours range from traditional wood colours to contemporary pigmenting: egg white, red, blue or even pink! Email or phone us for a free assessment of your wooden floor. We can also show you a range of coloured waxes and stains - to help you choose those that meet your needs. Make sure your gym floor reflects your quality - contact us today! More durab le than oil sealants, and easier to maintain, these products are typically used for mid to heavy traffic areas. Modern lacquers no longer produce the 'plastic' look of old and offer a silky sheen in a matt, satin or high gloss finish. As it is not a natural material, it can restrict the breathability of your wooden floor. We usually recommend three applications - leave the floor for 24 hours to ensure full strength sealing. Phone or email us for a free assessment and comparison of recommended sealants. For the best sealing for your new gym floors – contact us today! Revolving vacuum cleaner brushes, and excess moisture, should, however, be avoided. All you need is a damp mop and a wooden floor cleaner, as recommended by the manufacturer. Where appropriate, specialist products can be used to maintain the finish. 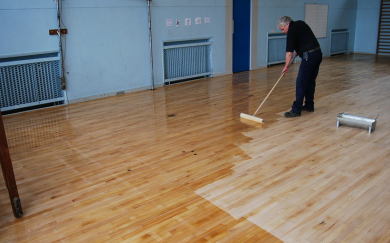 In the long term, your gym floor will lose its lustre, so can be refinished with new coats of lacquer, by lightly sanding down the original surface and recoating. Please phoneﾠ 020 3369 5105ﾠ or email us for a no obligation quote. Get an Instant Quote !